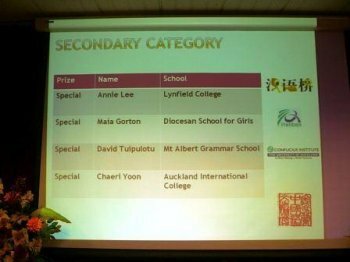 Lynfield College students shone at the fifth "Chinese Bridge" Speech competitions for secondary students, held at the Confucius Institute at the University of Auckland. 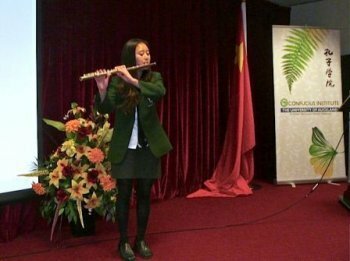 The competition celebrated the 40th anniversary of the establishment of the diplomatic relationship between China and New Zealand. 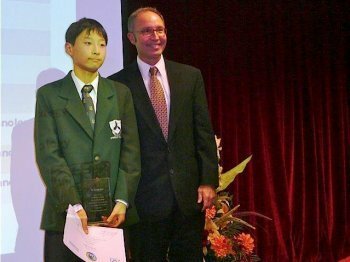 The prize giving ceremony was held in 29 May 2012. 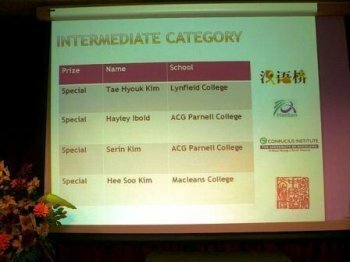 Annie Lee, Year 12, and Taeo Kim, Year 10, both won special prizes which qualified them for the national competition. Images below were taken at the ceremony. They went to Christchurch on 26 May, for the national competition. Taeo won first prize in the intermediate category and Annie won second prize in the secondary category which gives her an opportunity to travel to China, with her flights, accommodation and food in China being covered by the organizer. Our teacher of Chinese, Judy Fang, was awarded a Best Coach Certificate. Congratulations to Taeo, Annie and Ms Fang. At the end of last month 16 Te Reo Maori senior students travelled to Rotorua with staff for a memorable learning and cultural experience. On the four day visit students were faced with a list of expectations : find out the history of the rohe, speak Te Reo Maori, learn tikanga of the marae, understand the history of the Maori Battalion, look at traditional cooking methods, visit Maori villages, deliver a pepeha on a given kaupapa, prepare a meal together in a wharekai using manaakitanga and have some FUN! Staff members Jennifer Leauga and Carol Te Bay accompanied the group as they visited Whakarewarewa, Te Puia, the Polynesian Spa, Rotorua Museum,Skyline Gondola and the Luge. The group stayed at the beautiful Taheke Marae, Opatia, where Manaaki Marae Assessments and speeches took place. 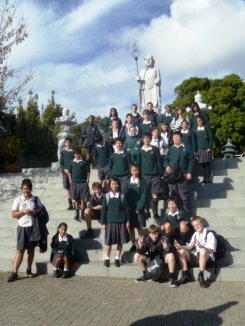 The knowledge and cultural experiences that the students gained were Taonga that will never be lost. He haerenga kia maumahara mo nga ra e heke mai nei, tena koutou ki nga tauira katoa e manaaki ana, ka miharo nga whanaungatanga kei roto i te roopu nei, he mihi mahana ki a koutou katoa! 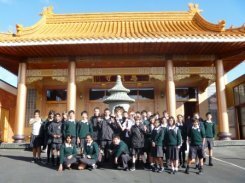 On Thursday 21 June Ms Fang organized a trip for all Year 9 students who studied Chinese this semester. 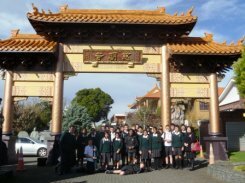 We went to learn some Chinese calligraphy in Panmure, to eat Yumcha, and to visit a Buddhist temple in Grey Lynn. We learnt calligraphy from an expert, Eva, who spoke little English (Ms Fang was her interpreter). 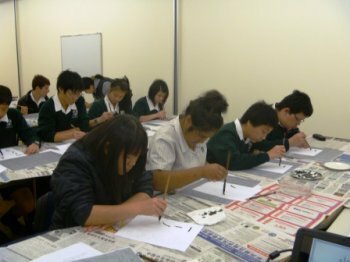 We learnt the six basic strokes of Chinese calligraphy. You had to follow the brush strokes, so you could paint the character correctly. You also had to sit up straight, legs straight, shoulders even, and the brush vertical. You even had to hold the brush in a certain position. I found this a challenge, as did many other students, as I had never before done calligraphy painting. This certainly was a wonderful experience. I would recommend it to anybody. Just give it a try! 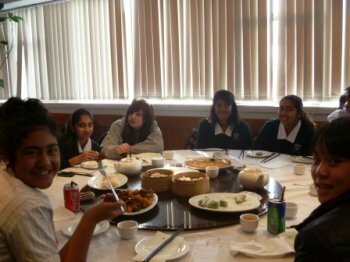 Next we headed to try some Yumcha which is a lunch of Chinese food dishes. We all had prawn dumplings with and without spinach, pineapple buns, sweet and sour pork, pork filled buns, beef bits, egg omelet, chomien, and to crown it of, a small cup of tea. Pineapple buns were by far the favourite of the day, followed closely by chomien. We crossed the road and headed to the Chinese Buddhist temple, dedicated to a Buddhist Goddess. We were all amazed at the number of artifacts, and their beauty, especially those coated in gold. The statue of the Goddess took centre stage, dominating the main room in the temple. Ms Fang showed as how to worship her - if done correctly this will bring you good luck. We headed back to school after a day of fun and learning for all students. It was a great experience for me, to learn how in Auckland many people maintain their culture, ways of life and beliefs. A big thank you to Ms Fang for her teaching and for organising this day for us. Our language students have once again proven they are worldbeaters by scooping major prizes in the Language Perfect World Championships 2012. 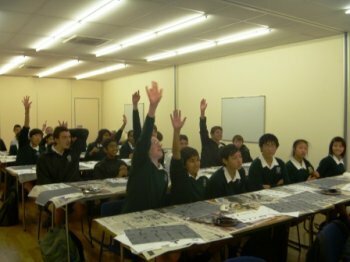 The students were tested on their reading, listening and writing skills in German, Japanese and Chinese, gaining points by learning words, and as they reached certain thresholds earning certificates and medals. 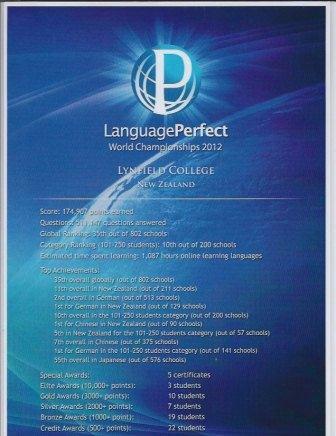 Lynfield College students were among 140,000 students from more than 800 schools from 10 countries and they answered 511,147 questions gaining 174,907 points which equal about 1,087 hours of online language learning. The results this year have been outstanding with Demi Cox(below left) and Sarah Plank(right) winning First and Second Prizes respectively. 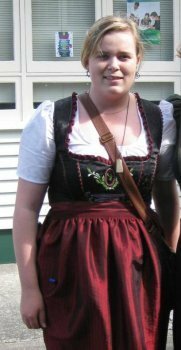 Both girls are outstanding German language students, and Demi certainly looks the part in her photo!